Pretty Boy is more than just a pretty face. 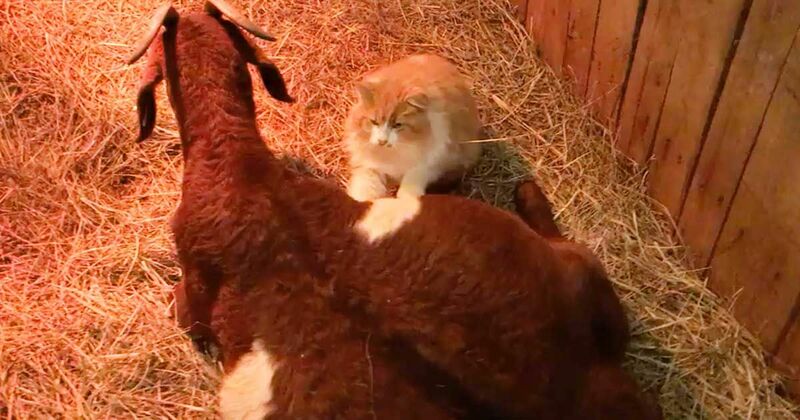 This very fluffy feline became so much more when he happened upon a female goat preparing to give birth. The compassionate cat quickly set to work putting the goat at ease. He gave her nurturing massages and stayed by her side for several days keeping her company and sleeping alongside her to keep her warm and comforted. When the goat finally welcomed three babies into the world, Pretty Boy was right there with her. He has truly become part of this goat family. For our part, we could not be more in love with this sweet and caring kitty cat. A pregnant goat from West Virginia had an unexpected birthing coach show up days before delivery: Pretty Boy, a male cat. Be sure to share this kindhearted cat's sweet story with your friends and family. It's sure to melt a few hearts.